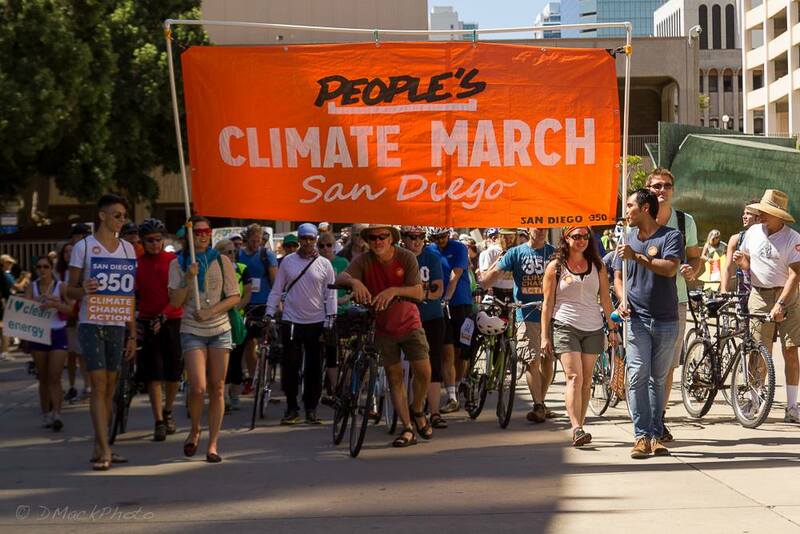 San Diego, CA – On April 29th, thousands of San Diegans joined the People’s Climate March under the slogan “Healthy People, Healthy Communities, Healthy Earth”. The marchers called on local leaders to support a just and rapid transition to 100% clean energy and to oppose federal efforts to rollback climate policies that protect our families. The local march, organized by a coalition of environmental, social justice, labor, and faith organizations, took place in solidarity with the People’s Climate Mobilization on the same day in Washington DC. Hundreds of other sister marches were also held around the country and the world. The event ran from 10 am to 2 pm, beginning with a rally at Waterfront Park, in front of the County Administration Building. Speakers included Assemblymember Lorena Gonzalez Fletcher, San Diego Councilmember David Alvarez, and Rev. J. Lee Hill, Jr., Senior Pastor of the Christian Fellowship Congregational Church (United Church of Christ). The event also featured live music, a Native American ceremony, a Kid’s Zone with games and facepainting. Opening speeches were followed by a lively, colorful loop march, and after regrouping at the park, additional speakers and a call for action. Organizers say that the administration’s failure to take climate change seriously denies San Diegans - and their children and grandchildren - the nation’s enshrined freedom to pursue the American dream. Coming on the 100th day of the Trump administration, this march was a rejection of the policies that threaten our freedom, future, health, and communities: policies that reject climate science and strip protections based on gender, race, immigration status, religion, sexual orientation, and disabilities. The climate march was a call to action to stand up to the Trump administration and Congress, to protect loved ones and the Earth and support our fundamental human rights: to live, survive, and thrive. These rights are threatened when we are denied access to clean air and water, healthy food, as well as access to housing, education, and jobs. Organizers affirmed the right of all to have clean air, clean water and healthy food, as well as affordable, convenient public transportation, living wages, justice and equality. The climate march organizers support policies that reduce energy consumption, defund fossil fuel projects, minimize pollution from transportation, and invest in 100% locally-made clean energy that creates green jobs. The march endorsed legislation in the California Senate to achieve 100% clean energy by 2045, and supported the water protectors in North Dakota and their rallying cry: “Water is life!” and the upcoming Labor Justice march on May 1st.